St. Patrick's Day in Chicago: I don't know how to put this but I'm kind of a big deal. St. Patrick's Day in Chicago: People know me. Yup it's a big deal! Chicagoans kinda go nuts. I actually have don't think I've ever been in Chicago for St. Patrick's Day ... at least since I could drink. The past few years I've had family things going on. This year will be different ... I will actually get to experience the crazy and some of the awesome Irish things to do in Chicago. I might get to see the green river! 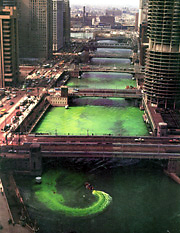 Every year the Chicago Journeymen Plumbers dye the Chicago river green. Yes yes I know the river is always green but that's more a puce green. I'm talking about a bright green, makes your red hair look like a firecracker when you wear it green. Since it looks like I will be starting out earlier in the day with Stephanie and the crew who actually live by the river I might get to see it!! If you're in Chicago go see it but I would wait until like 11am (dying is at 10am) people say it's a madhouse when they actually toss the dye. I'd wait for everyone to head to the parade in the park. If you're looking to learn more about Irish Chicago head north to the The Irish American Heritage Center. It's a bit of a hike up to the Mayfair neighborhood but the Blue line will take you straight from the Loop to the Montrose stop three blocks away. There is everything in the IAHC. 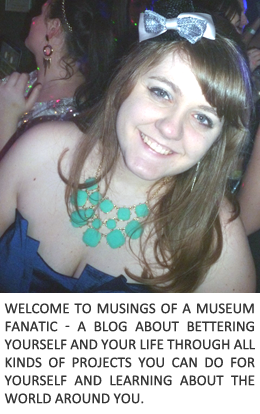 It has a museum, library, theater, classes, dance studios, and so much more. You can learn about your Irish heritage, take a language class, attend a concert ... I'm pretty sure I would need more than one afternoon to experience all the IAHC has to offer! In addition to the usual 'Stache crowd at the show it looks like we might be joined by one of my other favorite bloggers ... Taylor at the Daily Tay. Stephanie worked her persuading magic ... or blackmail for all I know ... and as of now she's coming out to join the crazy with us. I'm so excited I love her! I live right on the river, and it was INSANE. I stayed home though and took pics from my balcony:) Hope you enjoy the day!